SMU Dedman School of Law Prof. Chris Jenks is visiting Naval Station Guantanamo Aug. 11-15. This is the third blog of the series. Naval Station Guantanamo Bay (“Gitmo,” for short), at the southeastern tip of Cuba, is not only the United States’ oldest overseas military base but it’s also the only one to exist in a country with which the U.S. does not have diplomatic relations. The story behind the U.S. presence there dates to the 1898 Spanish-American War. Given U.S.-Cuban relations now, it’s worth remembering our country’s invasion of Cuba at that time was in support of a Cuban insurgent movement rebelling against their colonial occupiers: Spain. Following the war, the U.S. helped establish the new Republic of Cuba. In turn, in 1903 Cuba agreed to lease 45 square miles of area now comprising Gitmo in exchange for $2,000 in gold coins per year. In response the U.S. agreed to use Gitmo as a coaling and naval station, and also allow free passage of vessels engaged in Cuban trade. Three decades later the agreement was further outlined in the 1934 “Treaty Between the United States of American and Cuba” signed by President Roosevelt and his Cuban counterpart. As part of the revised terms, the payment (rent, actually) was recalculated on what $2,000 in 1903 gold coins would be worth in 1934, or roughly $4,085 — a fixed amount the U.S. has paid ever since. Given our countries’ mutual dislike of each other, how this treaty manages to exist as-is lies in the treaty itself, specifically Article III, which notes that the treaty is to remain in effect “[u]ntil the two contracting parties agree to the modifications or arrogations.” So in essence the U.S. has a rent-controlled lease with a mutual break-up clause. Following the Communist revolution and Fidel Castro taking power in 1959, Cuba’s attitude toward the U.S. and its Gitmo lease has changed, to put it mildly. Specifically, the Cuban government has refused to cash its U.S rent checks for more than 55 years. Castro literally has stuffed the un-cashed checks in his desk drawer (though he does acknowledge accidentally cashing one in 1959). Over the years, many military and diplomatic escalations have occurred between the two countries. And while political difficulties continue, the military relationship has stabilized. But this wasn’t always the case. Early on, the Cuban military began throwing rocks onto the tin roofs of the U.S. Marines’ sleeping barracks, prompting the Marines to build a 40-foot high fence. The Cubans then hung metal objects on the fence to clatter in the wind, prompting the Marines to add barbed wire to the fence. 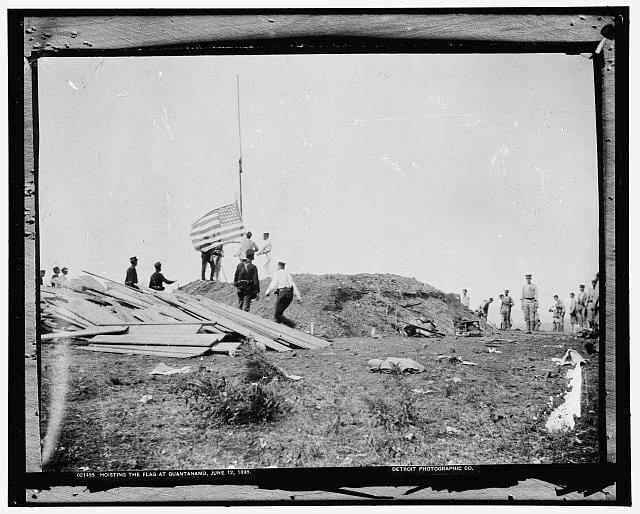 Both sides then erected ever-taller flagpoles, with Cuba technically winning that competition by planting a giant flagpole on a significant ridge. In addition, the Cubans also enlisted a high-powered spotlight to shine into the windows of the Marines’ barracks. In turn, the Marines erected a giant tent as a light shield. (Or so the Cubans thought.) Thirty days later, when the Cubans turned on the spotlight, the Marines dropped the tent, revealing a giant Marine Corps globe and anchor symbol on a concrete slab. Needless to say, the Cubans turned off their spotlight. 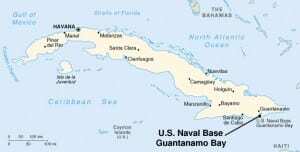 Cuba began availing itself of the media to complain about the U.S. presence at Gitmo. 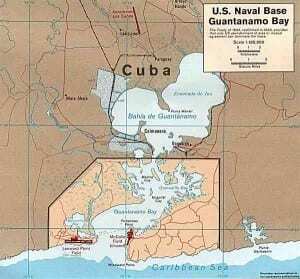 In the mid-1970s the Cuban Ministry of Foreign Affairs published an 86-page booklet, “Guantanamo: Yankee Naval Base of Crimes and Provocations.” Shortly thereafter, during a 1977 Barbara Walters interview with Castro, discussion of the 1934 treaty led the Cuban leader to argue “when one mentions an undetermined length of time in a legal contract, it’s understood that it means 100 years.” Regardless, both Cuba and the U.S. understand that the agreement will continue to exist until both sides agree to modify or repeal it. More recently the Cuban government has complained to United Nations human rights organizations that the U.S. use of Gitmo as a detention facility is itself a human rights violation. That’s a rather odd complaint coming from Cuba, since while Gitmo is used to hold al-Qaida and Taliban detainees, Cuba first used the place to detain thousands of Cuban “excludables” or refugees. — C.J. This entry was posted in Prof. Jenks at Guantanamo. Bookmark the permalink.